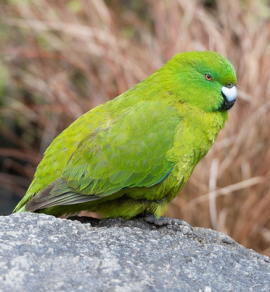 The main diet of the Antipodes Green Parakeet is leaves, which are chewed; piles of chewed foliage still attached to the stem of the plant are a sign of feeding. Both adults olive/green plumage; bright emerald green crown and face; breast and abdomen more yellowish; outer web of flight feathers blue; green tail, edged with green/yellow. Bill silver/grey with dark grey tip. Eye orange/red. As in adults but with shorter tail. Bill pink/white in youngsters. Eye pale brown. Described as resonant and penetrating - kok-kok-kok-kok. Similar to calls of other Cyanoramphus sp. but much deeper in tone. Also soft chattering. Parrots: A Guide to Parrots of the World, Juniper and Parr, 1998. Parrots: Survey Status and Conservation Plan 2000-2004, Snyder, McGowan, Gilardi and Grajal, 2000. Apparently not kept outside of New Zealand. 3.5 x 1 x 2m (11.5 x 3.3 x 6.5 ft) enclosure. Green leaves such as: Swiss chard, dandelion, chickweed, lettuce, sowthistle; small seed mix such as: hemp, millet, canary seed; limited sprouted sunflower seed; fruit such as: apple, pear, banana, cactus fruits, oranges; vegetables such as: carrot, celery, green beans, peas in pod, corn on cob; small amounts of clean mealworms; vitamin and mineral supplements; commercial kibble if taken. Provide with unsprayed flowering branches with buds, provide bowl for bathing. If possible, soil for digging. The accidental introduction of predators is a threat to this species. Found on Antipodes Islands, New Zealand. Is found in dense tall Poa littorosa tussock grasslands, open scrub and Carex sedge. Also in areas of prickly fern and Coprosma antipoda scrub. Commonest on steeper slopes and near water. Eats leaves, seeds, berries, the carrion of dead penguins and petrels and the eggs of seabirds. Are found singly or in small groups. Feed mainly in morning and before dusk. Birds very tame and inquisitive. Birds bathe in pools and roost in burrows.